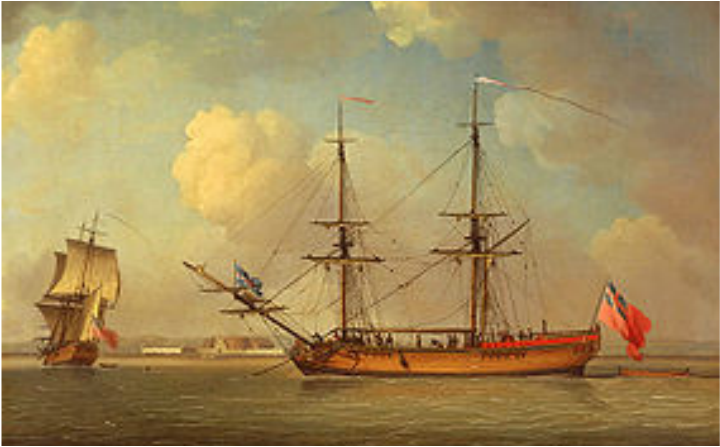 The ship "Samuel" that brought Hans Adam Büdinger and his family to Philadelphia was a two-masted snow rigged vessel of the type shown in this 1759 painting by Charles Brooking. "The journey lasts from the beginning of May to the end of October, fully half a year, amid such hardships as no one is able to describe adequately with their misery. The cause is because the Rhine boats from Heilbronn to Holland have to pass by 26 custom houses, at all of which the ships are examined, which is done when it suites the convenience of the customhouse officials. In the meantime the ships with the people are detained long, so that the passengers have to spend much money. The trip down the Rhine lasts therefore four, five and even six weeks. When the ships come to Holland, they are detained there likewise five to six weeks. Because things are very dear there, the poor people have to spend nearly all they have during the time." The second stage of the journey was from Rotterdam to one of the English ports. Rotterdam was the favorite starting point fr the ocean journey. Another harbor in Holland which was frequently used was Amsterdam. From Holland, the ships called at a port in England to be passed through the custom house. There was again a wait of one to two weeks to pass through customs and possibly a wait for favorable winds. Hans Adam Büdinger and his family traveling, on the ship "Samuel", out of Rotterdam stopped at the Port of Cowes on the Isle of Wight In England. When the ships had for the last time weighed their anchors at Cowes or some other port in England, then writes MIttelberger, "the real misery begins with the long voyage. For from there the ships unless they have good wind , must often sail eight, nine, ten to twelve weeks before they reach Philadelphia. But even with the best wind the voyage lasts seven weeks." The third stage of the journey, or the ocean voyage proper, was marked by much suffering and hardship. The passengers being packed densely, like herrings, as Mittelberger describes it, without proper food and water, were some subject to all sorts of diseases, such as dysentery, scurvy, typhoid, and small-pox. Children were the first to be attacked with disease and died in large numbers. Mittelberger reports the deaths of thirty-two children on his ship. Of the heartless cruelty practiced he gives an example, which will not be repeated here. The terrors of disease, brought about to a large extent by poor food and lack of good drinking water, were much aggravated by frequent storms through which ships and passengers had to pass. "The misery reaches the climax when a gale rages for two or three nights and days so that every one believes that the ship will go to the bottom with all human beings on board. When at last the Delaware River was reached and the City of Brotherly Love hove into sight, where all their miseries were to end, another delay occurred. A Health officer visited the ship and, if any person with an infectious disease was discovered om the ship, the ship was ordered to remove one mile from the city. As early as 1718. Dr. Thomas Graeme was appointed to visit and report on all incoming vessels. But no reports from him are on record until the year 1737. [i] Strassburger, Ralph Beaver, 1931, Pennsylvania German Pioneers, ed. William John Hinke, Pennsylvania German Society, aNorristown, Pennsylvania, 771 p.
[ii] Mittelberger, Gottleib, 1898, Journey to Pennsylvania in the year 1750 and return to Germany in the year 1754, English translation by Eben, Carl Theodor, publisher John Jos. McVey, Philadelphia.